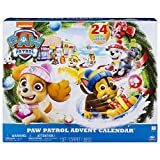 Spoiler Alert: Get them an advent calendar with their favorite characters (and toy)! 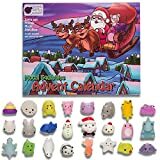 Advent calendars actually started in the church but, most recently, they’re in everyones house as a fun way for the kiddos to countdown the number of days until Christmas and get a little surprise treat or two each and every day. Similar to The Elf on the Shelf, realistic parents use these calendars as a way to bribe their kids to “be good” and “stop fighting with their sister” or else “you won’t be able to open your calendar box today!” Isn’t parenting grand!? 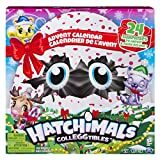 Typically, you’ll start using your calendar on December 1st and each day the kiddos will open up the surprise box for that day and see what kind of little toy or gift is inside. This fun little activity will take place each day until Christmas (or the 24th if actual Christmas morning trumps your calendar gift which, to be honest, it usually does). 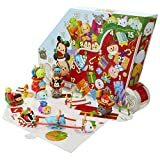 Some of these advent calendars will come with the little gifts as part of the package and others are empty (and more ‘box-like’) and you can fill it with whatever you want. One thing we know for sure is that you typically need to get yours ASAP because it’s nearly impossible to find one once November rolls around. Check out some of our favorites (so far) this month. Perfect for the kiddos who are 100% obsessed with all things L.O.L right now (there are so many LOL Surprises on the holiday toy list this year). This one comes with 24 different LOL surprises and even comes with 1 exclusive doll! Learn more about the LOL OOTD calendar here. This one also comes with 24 different surprise gifts, plus they can totally build this one themselves and play with it! It comes with 11 different vehicles (our favorite is The Phantom) and seven little LEGO people, including a holiday themed one! They’re still obsessed with those Disney Tsum Tsum characters and, well, so are we! This super fun option comes with a total of 18 different figures they can play with (all in holiday garb!). Plus, there are 6 different Christmas head pieces and 6 different Christmas themed accessories. They’ll enjoy all 31 pieces in total and, hopefully, they’ll behave! This is the perfect option for when you want to add the little toys or gift yourself. There are 24 different drawers to open and once they do they can turn the drawer around, place it back inside, and reveal a cute holiday themed picture! More: Shop Some of the Hot Toys for Christmas Right Now! This super fun playset comes with 72 pieces! Even better, it comes with 24 different items (that are a total surprise) for each day that leads up to the big event…Christmas! Plus, the little figures are super fun to play with any day of the week. This option is one of our favorites because your kids can build a real winter wonderland! It comes with 24 different surprise gifts, really cool vehicles (like a drone, spaceship, etc), 5 little LEGO people (like a snowman and Santa! ), and 313 pieces! They’ll be able to build this one themselves, but you can always help them too because, let’s be honest, it’s fun and it basically like meditation for us at this point. Oh yes, this one comes with 25 surprise inside! Cabbage Patch Kids really reminds us of our youth and your kids will love it too! This one comes with 9 figures, 16 accessories and even a really cool collector guide. We love a Cabbage Patch countdown to Christmas! This is one of the nicer options because is made of wood, which really sets it apart from most of the others. It’s super easy to use too because all the ornaments and star are magnetic so it’s perfect for the real little ones. This is the perfect option for all the little hockey fans out there, whether they love to watch it on TV or love to play it themselves! Like many of the others, this one comes with 24 surprises, 2 hockey people, Santa (who’s the ref! ), two kid figures, the goal, the Stanley Cup, and so much more! This one is geared towards girls, but boys can enjoy it too (welcome to 2018!). It has 24 different gifts, exclusive holiday figures, a Christmas tree, snowman, and so much more! Enjoy all 217 pieces while building it!